The Rotork Gears division of Rotork Australia presents the new 242 Series manual quarter-turn gear operators that benefit from the latest design technologies to provide optimum robustness and durability with minimal non-structural mass and reduced overall size. Rotork’s 242 Series manual quarter-turn gear operators are available in a range of five sizes designed to accept valve stem diameters of up to 70mm (or 58mm square section) and deliver an output torque range of up to 2100Nm. 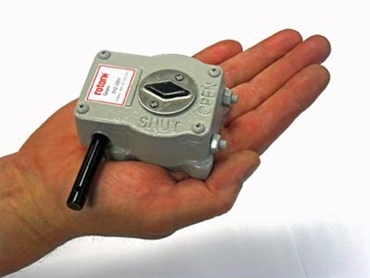 Built with standard ISO base dimensions between F05 and F25, the simple and rugged 242 Series gear operators are ideally suited for low torque manual applications. Options include stainless steel input shafts and fasteners, Namur and Westlock mountings, an IP68 temporarily submersible enclosure and a padlock kit. A rendered CAD image of the 242 has been selected by Siemens for the Solid Edge ST5 design software splash screen and will appear in rotation whenever users around the world start using Solid Edge ST5.